When the PT-76 tank was designed, in parallel with it there was the requirement for an amphibious armored personnel carrier version as well. Developed by VNII-100 and the “Krasnoye Sormovo” and Chelyabinsk Kirov Factories in 1949, it used much of the same design and many of the components of the PT-76. Initially given the designator Article 271 as a Leningrad Kirov Factory design, it was later redesignated Article 750 to show that Chelyabinsk had the lead. After a lengthy troop testing and evaluation period, Article 750 was accepted for service in 1954 as the BTR-50P with the designation standing for “armored personnel carrier-amphibious”. This was an open-topped vehicle with seating for 20 troops, a commander and a driver. The commander was provided with a mount for a 12.7mm DShKM machine gun which comprised the armament of the vehicle. In 1954 a further version was introduced, the BTR-50PA, which had a mount for a 14.5mm KPV heavy machine gun, designed for ground support and antiaircraft fire. But the open topped vehicle was quickly seen as vulnerable to both shell fragments and the developing nuclear warfare threat, and so a covered version was designed with at least an air filtration system to provide some protection from radioactive dust or chemical weapons. This new version, the BTR-50PK, was accepted for service in 1958 and was now built at the Stalingrad (later Volgograd) Tractor Factory. The new vehicle carried the same number of troops, but now could also be fitted with rails to mount up to two metric tons of cargo on the top of the troop compartment (without troops of course!) A single 7.62mm SGMB (later PKB) machine gun was provided with two different guide rails in front of the troop hatches for mounting the weapon. 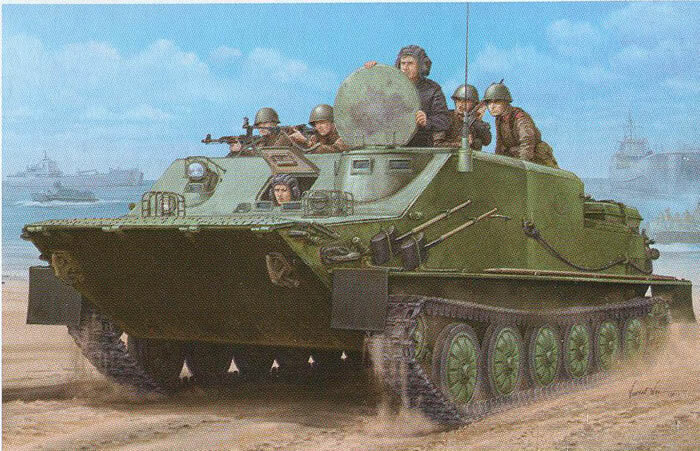 Later command versions were built with a second “pulpit” mounting on the right side for the unit commander; these were BTR-60PU variants. The OT-62 TOPAS was developed from this version, and the Chinese also developed a similar but unrelated Type 77 vehicle on their version of the PT-76. Thousands of these vehicles were built until 1966 when the new BMP-1 finally went into service and production. They served (and still serve) with many armies today, with the most famous use of them being the Israeli “false flag” raiding party that crossed over the Suez Canal in 1973 and tore up the Egyptian rear area. Back in 1958 Ideal released a motorized kit in 1/32 scale of the BTR-50P which came with a crew of 16 figures and other items, but as it was the mid 1950s it was not very well detailed or accurate. About 10 years ago, Eastern Express released one based on its PT-76B chassis which was a great advance, but left out many details needed to properly create the vehicle such as its very involved headlight guards. About three years ago Trumpeter released this model to go along with their new line of PT-76 tanks, and it used the same running gear and lower hull of those kits. It is a quantum jump ahead of those kits and comes with a neat little fret of etched brass for the rather gnarly (and not in the surfers’ use of the word!) headlight guards. The kit shows that it is based on the original Model 1958 version of the BTR-50PK and as such has an upper hull 14mm high on the kit; this matches the PT-76 Model 1958 that entered production at the same time. The Model 1954 should have an upper hull (aft of the casemate) of 12.3mm, and the 1962 and later production runs 16mm. The engine deck changes in design with each version, and the main visual result is watching the radiator air intake “sink” down into the engine deck. The model 1962 also had a different bow design (again to match the PT-76B which went into production at that time) with a different angle and longer slope. Therefore it is fine for the four years of its production run. As it sadly comes without an interior (the BTR-60s did, so it is surprising Trumpeter left it out of this kit) the model is really a simple kit of less than 200 total parts. Assembly is straightforward with the suspension coming first and then the only interior bits, the water jet drives (A1/A3). The kit comes with black vinyl tracks (noted as “can be assembled with plastic cement”) but Trumpeter offers a set of three-piece single link tracks for the model as Kit No. 02047. These have tiny separate guide teeth so many modelers may want to just use the kit tracks or another, simpler option like Fruil. The upper hull has surprisingly few parts to it – mostly handrails – and goes together quickly. It comes with separate commander’s, driver’s and troop hatches; but they have minimal interior details and open on – nothing. Trumpeter thoughtfully provides the modeler with bending jigs for the headlight guards (PE-A4 and PE-A3) which solves many problems. In Step 8 the directions get murky. Parts E33/E5/E4 are the commander’s IR searchlight guard which goes on the FRONT right of the hull; directions indicate “stick here” on the rear. Also the antenna pot (E27/E30/E29) goes on the FRONT left side of the hull. The kit comes with finishing directions for two different vehicles, all in dark green: unidentified Guards unit; East German NVA vehicle number 1207. A “number jungle” is provided for any other option the modeler chooses. Overall this is a nice kit as far as it goes, but Trumpeter appears to have cut a few corners which is a shame considering how many countries used it and that it would not have been that difficult to add the machine gun or troop seats.